Kharkov, Ukraine. Information about City. 1653 age this year is considered the year of the foundation of the city Kharkov. What is the origin of the city's name? There is a legend about it. Long ago, there was a farmstead of a rich peasant in this place. His name was Khariton, but people called him Kharko, and the place where he lived was called Kharkov's farmstead. After that the whole place was named Kharkov. 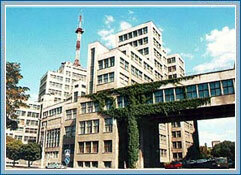 But, most probably, the city received its name after the river which is flowing through Kharkov. Its name is Kharkov, too. The other river which is flowing through Kharkov is the Lopan'. A settlement was organized in the place where both rivers meet. The first settlers were Ukrainain peasants and Cossacks. This place was well protected. From three sides there were swampy banks and from the fourth side it was surrounded by a vast forest. Right now it's a huge industrial city. There were 21 higher educational institutions with 127.000 students. There were 193 schools with 167.000 children. There were 6 theatre, 3 publishing-houses, 21 cinemas, 900 libraries, 3 museums, 65 hospitals. There were 31 tram, 32 trolleybus, and 52 bus lines. The population of Kharkov was 1.428.000 people. THIS PROGRAM IS THE SOLE PROPERTY OF KHARKOV HOTELS AND MAY NOT BE COPIED IN ANY WAY OR FORM WITHOUT EXPRESS PERMISSION FROM KHARKOV HOTELS.